Philips BDP3100 review | What Hi-Fi? Great news for those of you out there yet to brave the Blu-ray waters: 100 or so pounds is all you need. The superb Sony BDP-S370 can now be found online for around that and it's joined by this Philips, yours for £130 (and no doubt even less if you shop around). Certainly it's pretty well specified. HD audio decoding is here, as is Profile 2.0 certification allowing you to access BD-Live content once connected via ethernet to your home network. 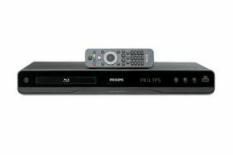 There isn't the added feature-set of the Sony, which includes DLNA media streaming and access to BBC's iPlayer and more, but a USB 2.0 output allows you to view DivX movies. As is becoming the norm for Philips, huge menu icons and a simple remote make it a doddle to use. Enjoying the high octane start to Ice Age 3, the Philips certainly has a cast-iron grip on fast motion, as various mammoths, sloths and saber-toothed squirrels speed across the screen. Colours are balanced and there's plenty of insight, though the best-in-class BD player does give a bit more texture and punch. Green Zone by contrast delivers more realistic colours and landscapes and brings human skin tones in to the equation. Sonically it lacks the dynamic reach of the very best around, with U2's 360° at the Rose Bowl Blu-ray, not quite packing the power and scale of rival machines. Stereo music tells a similar story, with decent timing but a lack of verve. We're impressed by this Philips. A certain Sony player mentioned earlier set a staggeringly high benchmark in this price band but the BDP3100 isn't a million miles off, meaning that if you're on a budget, this is another player to consider.